So what makes a good civic space? And why is Barcelona an interesting place to consider this? In the 1980s Barcelona launched an impressive urban design and reconstruction plan fueled by a social strategy to humanize the city and correct its inequalities. This plan was initially propelled by Spain’s post-Franco democracy, which resulted in ailing urban, social, and infrastructural defects. The reinstatement of democracy in Barcelona and all of Spain, especially at the local level, allowed for the development of funding, political consensus, and new institutions and citizen groups. Although the city was already quite cosmopolitan, the inherited situation was grave and a motion for urban, architectural, and artistic strategies among all scales of the city’s streets, plazas, gardens, parks, and neighborhoods were long overdue. So too was the need for new local landscape-inspired physical typologies of civic spaces (beyond the traditional square or plaza), as well as less functionalist planning terminology rooted in archaic zoning and land use frameworks: streets, not “thoroughfares”; neighborhoods, not “residential zones.” Art and quality design for all citizens would soon become a defining design and policy element linking neighborhoods with permanent and temporary forms of culture. The synergy between all these aims reflected one of the most prosperous periods of Barcelona’s history. Interior park in Barcelona’s Eixample district. Later this plan would feed the success of the 1992 Olympic Games in Barcelona, which laid the groundwork for much more opportunistic citywide transformations. The city would soon learn that the success of Barcelona’s civic space plan was its respect of the city’s tradition of shared and collective spaces. 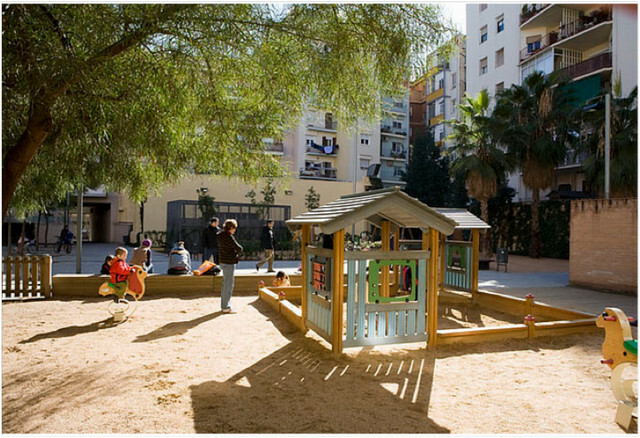 Barcelona made a conscious decision to consider social improvements in disadvantaged areas of the city and prioritized the design policies of specific and much needed spatial civic interventions. Similar to the lessons from the City Beautiful movement in the United States of the early 1900s, Barcelona was faced with balancing planning for practical and useful design elements rather than those only geared towards the social elite. How could Barcelona’s legacy of high-quality private design be applied at a more domestic, accessible, and citywide level? Beginning from disinvested neighborhoods to the development of peripheral districts, the city developed pioneering physical and social connections with existing and new central areas (with more attention at the local level). This included the creation of multi-use areas for recreation, socializing, freedom of expression, and other daily rituals – an energy that created a regional continuity and mobilized the public. Furthermore, the city seized the opportunity to exert its competitive edge with northern European countries and redefine its relationship with its Catalonian landscape – the mountains, the plains, and of course, the Mediterranean Sea. With the Olympics and beyond, Barcelona was ready to welcome the world. The city was proud of itself. Barcelona became a capital for modern urban planning. As the physical structure of the city changed, so did the demographics of the city’s 1.7 million residents. New residents included rapidly increasing immigrant populations from north Africa and the Middle East as well as in-migration from the south of Spain. These populations were necessary to support Barcelona’s renewed public presence and to continue to renovate the city. Furthermore, as the social architecture of the city is made of its people, civic space designs were intended to promote civic growth and celebrate diversity from a social perspective. Barcelona learned that a space’s connection to its social elements were far more important than the design of a brand name designer. Today Barcelona is a hub for a vast cross-section of people: tourists, business travelers, immigrants, students, and natives and long-time residents at all aspects of the economic strata. The one thing they have in common: they all use the city’s civic spaces. Whereas these civic spaces where once rooted to local needs, now they are managed to fit Barcelona’s new international tourism brand. What does this mean for the contemporary uses and needs of civic space in Barcelona? Will this over-simplify the original intention of these spaces or will the public find new ways to inhabit their space in the city? The upcoming posts in this series will be individual profiles in public space in Barcelona. This is the third post in John’s series, Transforming Civic Space: Learning from Barcelona. This series is part of the Portraits of Place project. I really found your blog to be really insightful and it really give me some ideas. will definitely recommend your site to my colleagues. definitely bookmarking this site. Keep up the good work! hope to see more of this!